Three songs from Hildegard Jone's Viae inviae, op. 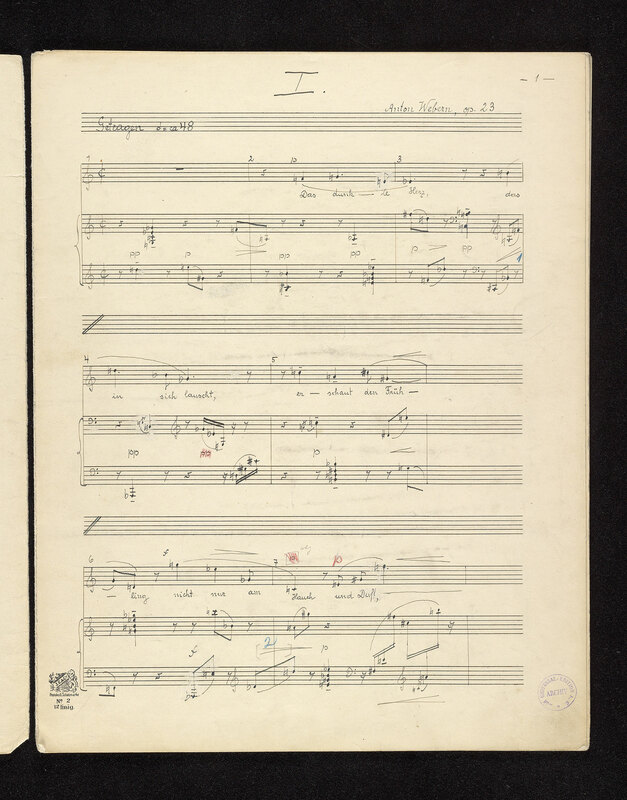 23 : autograph manuscript, 1934? Fidelio (1806). Ouverture (Album leaf) . Symphonies, no. 7, op. 92. Sketch. Sextets, violins, violas, violoncellos, no. 1, op. 18, B♭ major; arr. Ave Maria, mixed voices, violoncello, organ, F major; arr. Caprices de Marianne. Mort de Coelio; arr. Concerto, violin, orchestra, op. 80, G minor; arr. Triomphe de Bacchus. Divertissement; arr. Lucia di Lammermoor. Regnava nel silenzio; arr. Sombrero de tres picos. Danza del molinero; arr. Fantaisies, piano, orchestra, op. 111; arr. Symphonies, no. 2, D major. Andante; arr. Ruslan i Lyudmila. Album leaf. "Jephtha, / an oratorio composed in 1751 / by / Handel / with additional accompaniments written 1870 / by / Sullivan"
Symphonies, no. 1, A major. Scherzo; arr. Říkadla (1925). Karel do pekla zajel; arr. Head over heels. Big show. Vocal score. Cantico del sol di San Francesco d'Assisi. Preludio; arr. Corrections to Elegie du Prince Louis de Prusse and to his arrangement for piano of "Mignons Lied"
Episoden aus Lenau's Faust. Tanz in der Dorfschenke; arr. Symphonies, no. 1, D major. Kräftig bewegt; arr. Pièces de genre. Mélodie; arr. When first that smile; arr. Douce amitié fille du ciel! Nozze di Figaro. Non sò più cosa son; arr. Symphonies, C major. Scherzo; arr. Donna Diana. Vocal score . Odes anacréontiques, op. 32. Ode XXXIV; arr. O beata solitudo! O sola beatitudo! Concertos, violin, orchestra, no. 2, op. 162, G minor; arr. Morceaux de salon, op. 32. Rondino; arr. Quartets, piano, violin, clarinet, saxophone, op. 22 . Gedichte von Scheffel, Mörike, Goethe und Kerner. Zur Ruh, zur Ruh! 10:30 a.m. to 5 p.m.
Friday: 10:30 a.m. to 9 p.m.
Saturday: 10 a.m. to 6 p.m.
Sunday: 11 a.m. to 6 p.m.
Free Friday Evenings, 7–9 p.m.
Closed Thanksgiving Day, Christmas Day, and New Year's Day. The Importance of the NEH to Our Work. The programs of The Morgan Library & Museum are made possible with public funds from the New York City Department of Cultural Affairs in partnership with the City Council, and by the New York State Council on the Arts with the support of Governor Andrew Cuomo and the New York State Legislature.